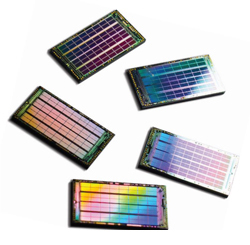 Silicon wafers are available in a variety of diameters from 25.4 mm (1 inch) to 300 mm (11.8 inches). Semiconductor fabrication plants (also known as fabs) are defined by the diameter of wafers that they are tooled to produce. The diameter has gradually increased to improve throughput and reduce cost with the current state-of-the-art fab using 300 mm, with a proposal to adopt 450 mm. Intel, TSMC and Samsung are separately conducting research to the advent of 450 mm "prototype" (research) fabs, though serious hurdles remain. 2-inch (51 mm). Thickness 275 µm. 3-inch (76 mm). Thickness 375 µm. 4-inch (100 mm). Thickness 525 µm. 5-inch (130 mm) or 125 mm (4.9 inch). Thickness 625 µm. 150 mm (5.9 inch, usually referred to as "6 inch"). Thickness 675 µm. 200 mm (7.9 inch, usually referred to as "8 inch"). Thickness 725 µm. 300 mm (11.8 inch, usually referred to as "12 inch"). Thickness 775 µm. 450 mm (17.7 inch). Thickness 925 µm (proposed). Wafers grown using materials other than silicon will have different thicknesses than a silicon wafer of the same diameter. Wafer thickness is determined by the mechanical strength of the material used; the wafer must be thick enough to support its own weight without cracking during handling.